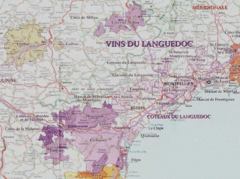 Bordering the Mediterranen, wine has been produced in Languedoc for more than 2000 years. The Greeks, and later the Romans, established colonies to produce wine and oil here. In later times the area produced high volumes of poor quality wine to blend with the strong wine imported from the North African colonies. During the 1960's the vines were replanted with the high volume, stronger, but still undistinguished Carignan grapes. With the worldwide excess production of wine, vignerons in the Languedoc area have been replanting with varieties intended to produce better quality wines. Producers from California, Australia, South Africa and elsewhere are currently buying up vineyards because of the good ground and the cachet of a French label. Increasingly, Grenache, Syrah, Merlot, Cinsaut, Mourvedre, Sauvignon and Viognier are used for wine making. The Languedoc is becoming a respected producer of quality wines. As in historical times, production of sweet wines, such as Muscat de Lunel and Rivesaltes continues along the coastal plains.